In Oakland and across the country, it is essential that we listen to the voices of teachers and celebrate their stories—now more than ever. With a likely local teacher’s strike, the prospect of shutting down two dozen district schools over the next few years, and our continued budget crisis, teachers experience undo stress that pulls them away from the classroom. But teachers are also exceptionally innovative and creative in meeting our most vulnerable learners’ needs. We must learn from their experiences, hear their stories, and invite them to the table to design solutions for education’s most pressing challenges. On January 24, in a joint event hosted by Agency by Design Oakland and The Teachers Guild, five Oakland educators shared their personal stories of becoming teachers. Exploring themes of creativity, courage, and curiosity, the speakers brought to life their classrooms, schools, and communities. It was an inspirational evening of community building and celebration of educators in Oakland. 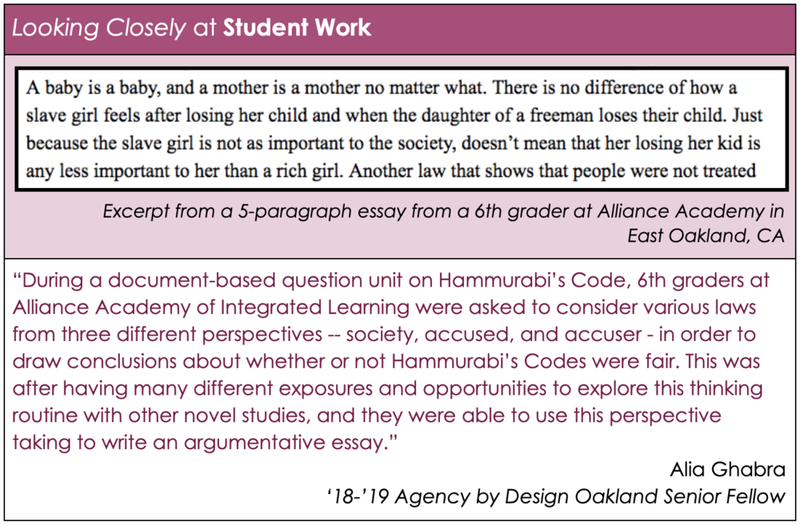 Monica, a current Agency by Design Oakland teacher fellow, is a relatively new teacher with a visionary curriculum. In her talk Monica discussed how she’s using real world issues in the classroom to cultivate the next generation of thinkers. "Education should help students cultivate their innate creativity and employ it in ways that are relevant to their community contexts." Reina, a former Agency by Design Oakland teacher fellow, shared her and her family’s forced asylum story from Nicaragua to Miami. A story of transformation and healing, Reina now works with Oakland students in public schools and understands deeply their lived experiences. Born in Afghanistan, Samia shed light on what it's like growing up as an immigrant in California. She shared her journey in becoming a dance artist and youth arts education advocate. Brandy shared her journey as a would-be-writer turned teacher, who then left education to become an entrepreneur. She now teaches Entrepreneurship and English at Arise High School, a charter school in Oakland. Collaboration is critical: Props to the amazing organizers of this event!